Intra-city or pan-Nigeria, Swiftlink Logistics Ltd is poised to serve you promptly and itch-free to give you value for money and peace of mind for choosing us. As a corporate body, Swiftlink Logistics Ltd is in good position to provide support service to relevant corporate bodies who may require competent delivery partners round-the-clock, with our state-of-the-art facilities and our highly-skilled, exposed and experienced personnel. It’s an e-World and Swiftlink Logistics Ltd is up to date, you can transact business with us entirely online 24-7 on our user-friendly portal or via live-chat 08.00 hours to 18.00 hours GMT+1, seven days a week. International operations will be launched soon nevertheless; we abide by global standards and world’s best practices even in our local operations at the moment. As a market leader in Planning and Logistics. Whether you require distribution or fulfillment, defined forwarding, or a complete supply chain solution, Swiftlink Logistics can provide you with a customized solution tailored to your needs. 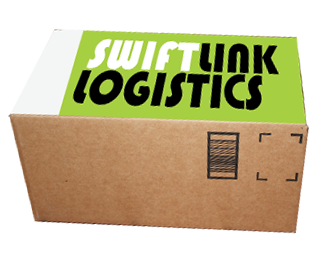 Swiftlink Logistics has a chain solutions that can optimize the effectiveness of your product promotion, and reduce the cost of your packaging and distribution as well as your carbon footprint. “Sales Lift” is music to any marketing, brand or merchandising manager’s ears. Swiftlinks Logistics understands the impact packaging. Swiftlink Logistics instant delivery solution is an ideal choice for individuals or organizations that needs to deliver a package or an order the same day the order was made. They are simply the best! I highly recommend Swiftlink Logistics. I have been using a couple of Logistic companies but Swiftlink Logistics simply cuts it for me, they understand time management and response rate is superb. Highly Recommended! They are the very best, i have sent a couple of packages via Swiftlink Logistics and so far i don’t have any complain. You guys rock! Their service is extremely on point! Their delivery service is awesome. Their performance was extremely successful. As a result of this our packages were delivered in time and within budget. They are customer friendly and deliver on time. They put customers first and their level of professionalism is just superb; i highly recommend them. focused on customer satisfaction, and they did deliver beyond my expectation! Suite 53 Lekan Salami Stadium Complex, Adamasingba, Ibadan. Swiftlink Logistics Ltd. does NOT have any arrangement with any individual or organisation to deliver any items by whatever definition: GIFT or PRIZE - in the name of any Nollywood Star or Celebrity in any Promo or Special Offer whatsoever. The general public is hereby warned to beware of scammers.